Producing a seasonal mix of vegetables; beginning with early peas and ending with fall squash and potatoes. A Certified Naturally Grown farm located near the South Toe River in Celo, NC. The farm produces a seasonal mix of vegetables; beginning with early peas and ending with fall squash and potatoes. Currently operating on a small scale with a vision towards a larger and more diverse output. 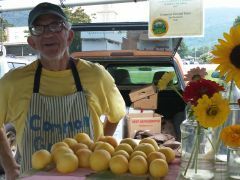 They currently sell at the Yancey County Farmers’ Market and The Wednesday French Broad Food Coop Market, plus wholesale and retail deliveries into Asheville.